Endurance House is your local one-stop-shop for running, cycling, and swimming in the Sarasota/Bradenton area. It is a national franchise with 16 stores across the country. Jerry Johnson had a 25 year career in engineering and information technology. He’d completed his first triathlon in 1987 sans training, and something clicked, as he says, and a seed was planted. But over the course of his career, while he did run and bike, he wasn’t committed; time did not allow it. But all the while, he says, he had “the desire to do something more meaningful with my career and life.” After a number of years without a regular commitment to being active, he got back in the saddle: he had a “realization that my outlook on life was always much better when I was more active I reprioritized my schedule to allow for more exercise.” Jerry completed a number of organized runs and several Sprint and Olympic distance triathlons from 2006-2010, but in 2011 and 2012; he completed two half-ironman events which led to him the Wisconsin Ironman in 2012… and to repeat in September of 2017. Still active in his IT career, he wanted to “embark on a new career, one that would be more in keeping with the things he was passionate about.” Running, biking, and swimming were his passion. So the mid-westerner packed up his family with partner in life and business, Amy, and headed where his very smart and savvy parents landed: Sarasota and it was in the 941 where thought a store that offered a year-round training environment was made to order. Today, Endurance House has not only endured, it has thrived. Jerry’s dream to provide “gold standard guest service to triathletes, runners, and walkers of all abilities in a genuine and encouraging atmosphere” was realized. Endurance House specializes in bike and shoe fitting and in helping to prepare folks for a triathlon, from the beginner to the elite athlete. Jerry says that at Endurance House they pride themselves in having the “right processes and tools to make sure you get into the right gear in all disciplines; swim, bike, and run.” Their Personal Movement Profile (PMP) for shoe fitting is a transparent process where you can see the difference between shoes, not just blindly trusting them. And Endurance House’s state-of-the-art Guru-automated fit bike makes bike sizing and bike fitting a smooth process that takes all of the mechanics of adjustments out of the fitting equation, letting you compare multiple bikes and sizes at the touch of a button…while you are pedaling. 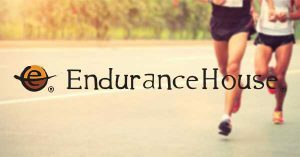 While Endurance House is geared to satisfy the needs of super competitive athletes, when it comes to Redefining Your Possible, it is all about the everyday athletes, the ones that just want to see what they can do, who just want to finish, or maybe finish a little faster than the last time. For more information about Endurance House including hours, services, product lines and much more, visit them at 5434 Lockwood Ridge Road in Bradenton, call 941-727-4411 or check out their website at SuncoastEndurance- House.com.